Last week on a visit to my doctor he proceeded to tell me in no uncertain terms that we all (including himself) should be eating flaxseeds, also called linseeds, everyday. 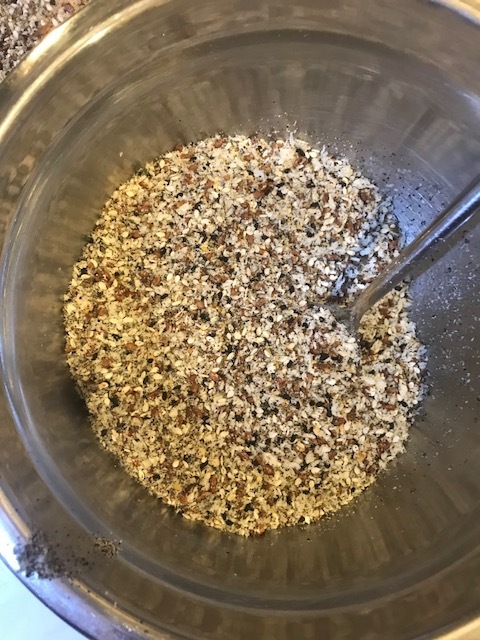 So we started and made a mixture of small seeds to use as a coating instead of breadcrumbs on chicken schnitzels and fresh fish fillets. 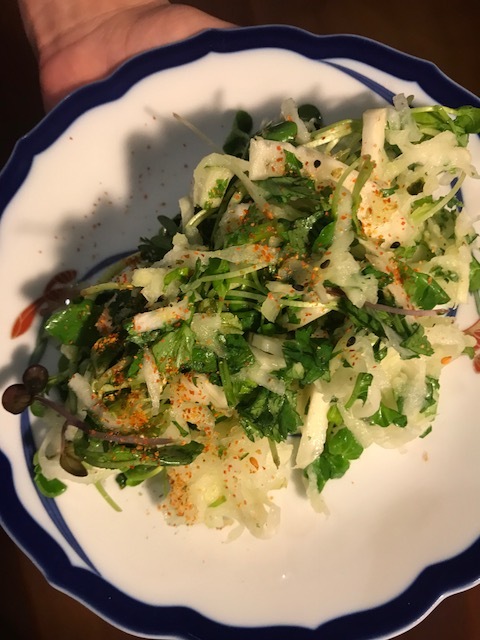 The result was delicious, so following is something really easy teamed with an easy salad made from all the vegetables we brought from Arek last weekend. I haven’t given quantities for each ingredient for the crumb as it totally depends on you and what you have available. You can use fewer ingredients or add other seeds as well. I’ve found it doesn’t. Mix together all the seeds in a bowl and spread them onto paper towel. On another paper towel place some plain flour. Beat 1 or 2 eggs in a bowl. Coat each piece of chicken or fish in the flour, then coat with some of the egg then lay each piece in the crumbs. Once coated place on a plate. Heat a little oil in frying pan and once hot enough place each piece in the pan. Turn over once they are all nicely browned. Cook the other side. The chicken pieces will take a few minutes to cook through but the fish will be quick. Again there’s no need to have exact quantities – you choose. Kohlrabi is a crisp, juicy and sweetish vegetable available from Arek. It’s season runs from May till August and is great mixed with a variety of other veges in a salad. We’ve only ever had it raw but I read its also able to be cooked. Once mixed together we dressed the salad with a shaken mix of 6 tbsps of sushi seasoning and 2 tbsps of finely grated ginger, salt and pepper. 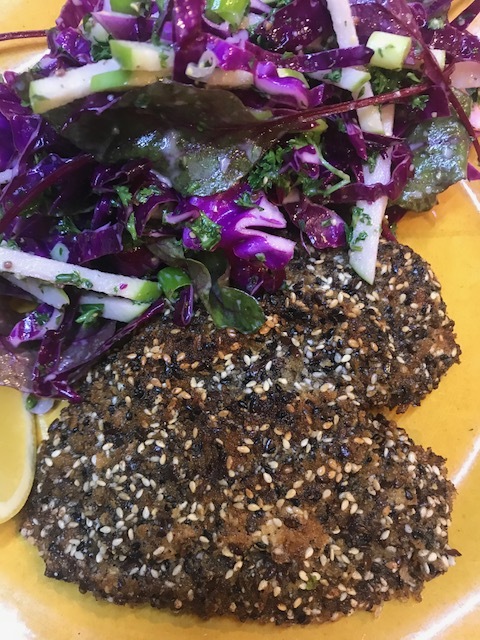 We had the kohlrabi salad with the crumbed fish but with the chicken schnitzel we enjoyed version of coleslaw using sliced red cabbage combined with baby beetroot leave, batons of peeled apple, sliced spring onion and chopped parsley. 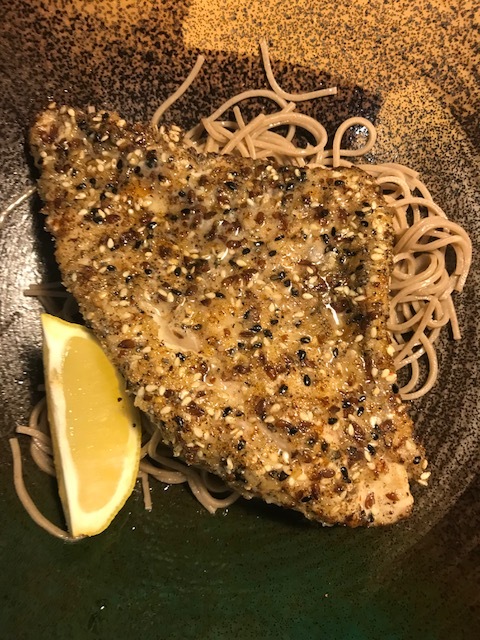 We dressed it with a mix of rice brand oil, apple cider vinegar, a little wholegrain mustard, salt and pepper and some Greek plain yoghurt.